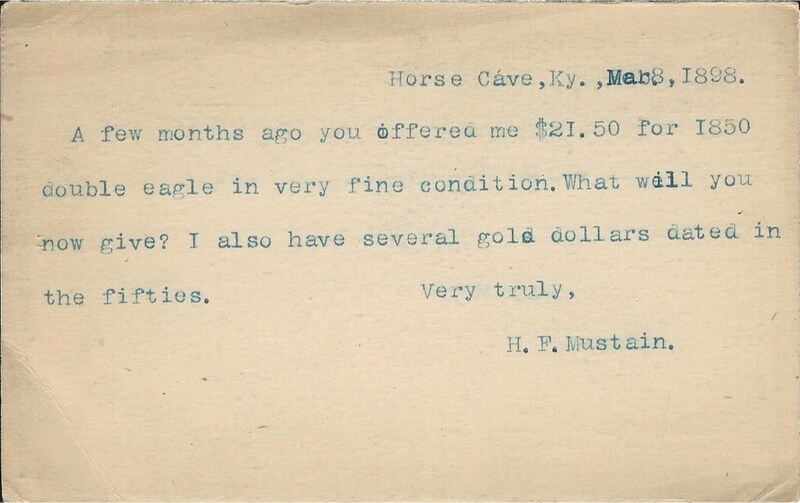 Henry F. Mustain (1848-1921), Horse Cave, Hart County, Kentucky. He was born the third of five sons of the ten children born to on July 9, 1848, son of Thomas Henry Mustain (1818-1892) and Mary J. Willis (1823-1858), at Barren County, Kentucky. From 1865 to 1882 he worked at his father’s store, and in the railroad and express office at Horse Cave. In the U. S. Census of 1870 he is listed as a warehouse clerk, and the 1880 Census as a store clerk. In 1882 he was elected as a cashier at Merchants Banking Company, Horse Cave, Hart County, Kentucky. On July 22, 1892, his father Thomas Henry Mustain died, who at the time was president of the Merchants Banking Company at Horse Cave. He died estimated to have been the wealthiest man in Hart County, Kentucky. Henry F. Mustain was a correspondent with the Chapman Brothers and in one particular time on March 1898, he offered for sale gold coins he most probably got over the counter from the Merchants Banking Company. In the Courier-Journal, Sunday, July 17, 1910, page 29 he was targeted as the agent in charge to sell off the assets of Union Planters Bank, Horse Cave, which had been ordered closed by the state. In the Courier-Journal, Sunday, August 7, page 36 he ran an ad selling the bank fixtures authorized as a Trustee. In the 1910 U. S. Census he is listed as a border in a rooming house and working as a real estate dealer. In the Courier-Journal, November 1911 he reported about pigeon sightings apparently having an interest as a birder. He was an angler who was lucky at fishing as reported in the Courier-Journal, March 17, 1918. A December 5, 1920 article in the Courier-Journal reports that he regularly spends his winters in Lakeland, Florida. On March 22, 1913 he sold his gold, silver and copper coin collection comprising 266 lots by Mail Bid Auction. Catalogues were sent free on request. He died a wealthy retired businessman at the age of 73 years, 2 months and 5 days old at his home on Church Street, on September 14, 1921. He is buried at Horse Cave Municipal Cemetery. March 22, 1913, 12 p., 266 lots. William Henry Perrin, J. H. Battle, and G. C. Kniffin, eds., Sketches from Hancock, La Rue, Hardin, Edmonson, Hart, Breckinridge, Grayson, and Meade Counties. (Genealogical Reference Co., 1970) : 86. Martin Gengerke, American Numismatic Auctions, page 447.